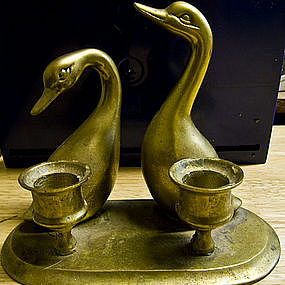 Vintage brass candle holder with 2 geese and 2 holders for candles. It measures 6 1/4 x 3 1/2 x 6 1/4 inches. It appears to be solid brass. There is no structural damage, but does have manufacturing flaws. I need your zip code to calculate the postage.